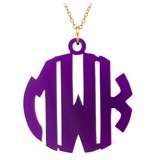 Monogram necklace can display up to 4 initials, nameplate up to 10 letters. 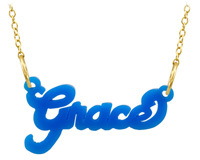 Check out one of the hottest celebrity trends this year, cut out monogram and nameplate necklaces. 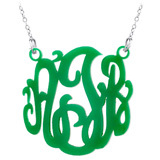 Each monogrammed piece is hand cut in an elegant script or block style. The pendant or nameplate is made out of sterling silver, gold vermeil or rose gold vermeil and is hung from a 16” or 18” chain. This look can be yours so treat yourself, you deserve it! Necklaces are also available in 10kt and 14kt gold, please email for prices. Each piece is hand cut so no two are alike; as a result, there is a minimum two week turn around. Gold Vermeil is made of sterling silver that is dipped in 14kt gold. Avoid applying lotions, hair product, or other chemicals while wearing any of this jewelry as these may damage them. Haute Glam Boutique will not refund or exchange jewelry that has been scratched or damaged by cleaning agents, cosmetics or other personal care products. Please use cleaning cloth provided in the shipment.